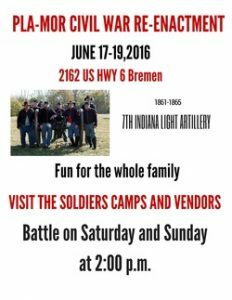 This weekend, June 17, 18, and 19, Pla-Mor Campground will host a Civil War reenactment by the 7th Indiana Light Artillery regiment. They will put on a battle on Saturday and Sunday. You can check the Bremen Public Library’s list of Bremen Civil War vets to see if someone in your family tree served in the war. Historic Bremen also has a photo album of vets. And of course be sure to watch our video of Lowell Roberts’ talk on Bremen’s Civil War participation.